They symptoms of fibromyalgia (FMS) or chronic fatigue syndrome (CFS or ME/CFS) are many and they can fluctuate like crazy—one day you feel pretty good, the next you can barely walk, and the next you feel all right physically but just can't concentrate or communicate well. With these kinds of ups and downs, how can you and your doctor hope to figure out what is going on with you? A symptom journal can be a big help. By keeping track of how you feel and what you do daily, you may be able to find patterns or identify triggers. Maybe it's something fairly obviously, such as that you're most tired the day after you go to the grocery store. Or it could be more subtle, like perhaps your flare-ups regularly start 14 days into your menstrual cycle, or you feel better after a day or two without red meat. A journal can help you spot these kinds of thing when you might otherwise miss them. It also can help you determine which symptoms are bothering you most often, which can be hard to verbalize to a doctor because you're most likely to talk about what's bothering you at the moment rather than overall. For example, if you typically see your doctor toward the end of the day, pain may be more prevalent in your mind because you're achy then, whereas a journal might show you're exhausted every day, but only bothered by pain three or four days a week. Knowing what symptoms you experience most, and to what degree, can greatly help inform your diagnosis and treatment, as well as help you make decisions about lifestyle changes and plan around things that are predictable. First, it's important for you to be familiar with the broad range of symptoms that can be linked to FMS and ME/CFS. You may want to print out a list and keep it with your journal so you can refer back to it. Also, if you notice symptoms that aren't on the list, note those as well. They may be coming from an overlapping condition that needs to be addressed. The most important thing to keep in mind when starting a journal is to keep it simple. If it takes only a few minutes to fill out, you're more likely to stick to it when you're feeling your worst (which can be the most important time to do it). Also, while several forms are available, you should tailor the records to your own situation and keep the information relevant to you. Experts have come up with different types of diaries or logs and a lot of templates are available online. You may want to experiment to see which method or combination of methods works best for you. One or more times a day, make a list of symptoms you're experiencing and rate their severity. This type of diary can help quantify your level of symptoms, identify which symptoms impact you most, pinpoint interactions between symptoms and document day-to-day changes. This sample symptom log can help you get started. By keeping an activity log, you can link what you do with how you feel. It can help to track things such as how much and how well you sleep, your exercise levels, how you feel when running errands, doing housework and socializing. You might also benefit from tracking your emotions and stress levels. This sample activity log shows you one way to to it. An envelope log can help you see how well you're staying within your limits, which is necessary for managing FMS or ME/CFS. Using a scale of 1 to 10, you rate your energy level, activity level and symptom level. If your symptoms are different at different times of day, it might help to fill it out two or three times daily. Here's a printable sample envelope log. What you don't want to do with your journal is take it to an appointment and hand it to the doctor. He/she doesn't have time to go through and analyze it to look for trends. The journal is to give you better knowledge of your condition so you can share the analysis with your doctor. Say you want to know what leads to good days. You can mark each good day and then scan the days before it, looking for consistencies. You can do the same thing for bad days or flares. If you suspect a problem with a certain type of food, you can mark the days you ate it and see if you consistently have bad days soon after. It can take some time, certainly, but identifying symptom triggers may be well worth it. 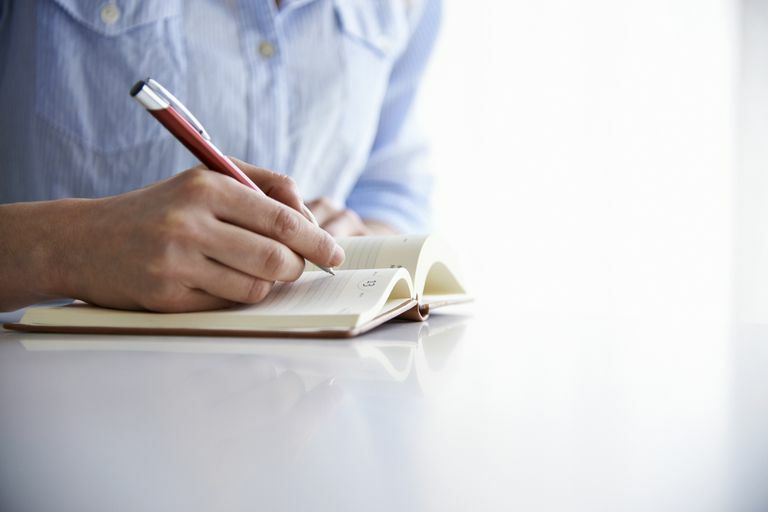 Some experts say keeping a more traditional journal about your life for personal rather than medical use can be a big help relieving stress and managing the emotional components of living with a chronic illness. You may even want to share your journal with people in your life to help them gain a better perspective on what you're going through. Maintaining a Good Relationship with Your Health Care Provider. Hearthstone Communications Ltd.
Keeping a Fibromyalgia Journal. Hearthstone Communications Ltd.
Campbell, Bruce. Ten Keys to Successful Coping. CFIDS & Fibromyalgia Self-Help. 2006.